Since the release of Instagram in 2010, it has become one of the fastest growing and popular social media platforms with more than 800 millions active users. This is an interesting figure and signifies that it is equally important to connect Instagram to your website like other social platforms (Facebook, Google+, Twitter, LinkedIn, Pinterest, etc). So, in this article, we will discuss some of the Best WordPress Instagram Feed Plugins for integrating Instagram feeds into your website. Instagram Feed is one of the best ways to enhance the content engagement of a website. It allows you to display the stories and post of your product, brand and recent work in a virtually appealing fashion. By doing so, you can make your website more informative as well as encourage your visitors to follow in your brand’s Insta account. Addition of Instagram Feed on a website can be done by using WordPress Instagram Feed Plugins. There are plenty of Free and Premium WordPress Instagram Feed Plugins available on the web that contains different features and possibilities. However, finding the best one may become a headache due to the availability large number of resources. So, to help you find a perfect WordPress plugin I have handpicked some of the Best WordPress Instagram Feed Plugins. For the collection of Free WordPress Instagram Feed Plugins, you can go through the article of Top 5 Free Instagram Feed WordPress Plugins. 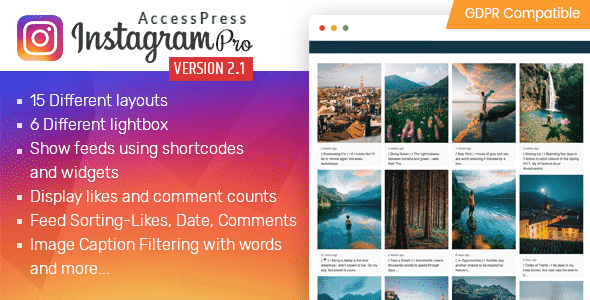 AccessPress Instagram Feed Pro is a WordPress plugin that lets you display your Instagram feeds with your desired layout. It comes with 15 different Instagram templates to display the Instagram feed and grow your network. Besides, the plugin also comes with shortcodes and widgets to display the Instagram feed right from your chosen location. It is a highly configurable plugin that comes with tons of options to customize your Instagram feeds and display them in a stunning way. Also, you have the option to choose the number of rows and columns or choose the number of images you want to display on your website. Besides, there is also an option to display your Instagram counter on your WordPress site. You can also check out the lite version of the plugin – AccessPress Instagram Feed. InstaShow is one of the WordPress Instagram Feed Plugin for creating charming galleries of your Instagram images. It is an ultimate Instagram plugin for displaying various photos from your Instagram with a great number of possibilities. The plugin comes with 60+ adorable parameters and 10 color schemes that help you to adjust and build your Instagram gallery in stunning ways. It is easy to use plugin that provides you the full control over the sizes of your images. Hence, you can set the width, gutter, and numbers of rows and columns of your image gallery. Besides, the plugin also contains popup features that allow you to display all your Instagram data in a popup form. 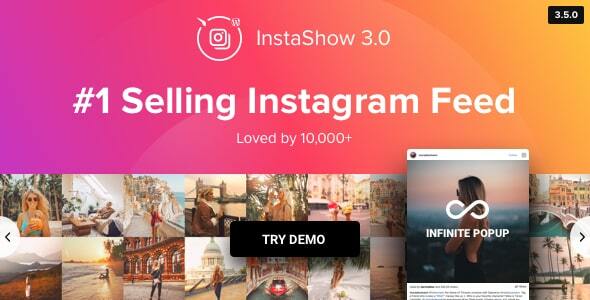 You can also check out the lite version of the plugin – InstaShow Lite. 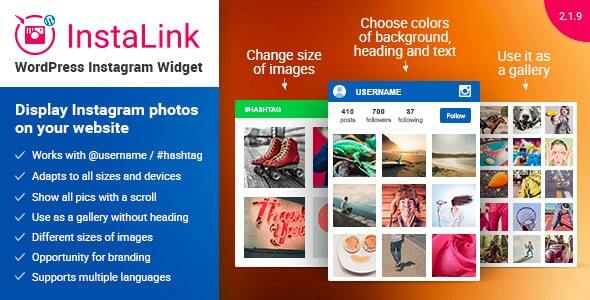 InstaLink is one of the best Instagram plugin for WordPress for displaying your own Insta account on your website. It is a responsive, flexible and user-friendly plugin with all the required features for displaying photos in a simple and eye-catchy way. It is a highly customizable plugin that contains more than 20 functions of the Instagram gallery for maximum impressions. Moreover, the plugin is shortcode ready that allows you to display the Instagram gallery in any page/post of your WordPress website. Instagram Journal is the most powerful and versatile WordPress plugin for showcasing the most beautiful Insta images on your WordPress website. It comes with 5 responsive layouts to display your all the portraits of your Instagram in an eye-catching fashion. It is a highly customizable plugin that is packed with 50+ customization feature for personalizing your feed as per your preference. Moreover, you can also add various captivating effects and transitions to your Insta feeds and display them on any page/post/custom post types. 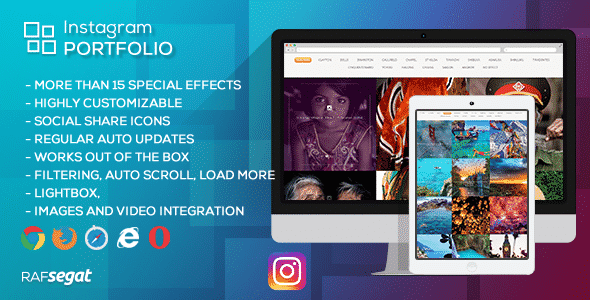 Instagram Portfolio is an advanced WordPress plugin designed to provide beautiful and highly customizable Instagram galleries on your WordPress website. It supports various media (images, videos) and you can display the gallery anywhere on your website using the available widgets and shortcode option. It is a modern WP plugin that comes with more than 15 amazing animations and hovers effects for providing a unique look to your Insta Gallery of your WordPress website. Besides, the plugin also integrated with amazing lightboxes to display your feed images in an eye-catching overlay. No doubt, Instagram is one of the most creative social media platforms for business promotions. Apart from business promotions, Instagram also lets you connect with your followers that are all around the world. So, if you want to add beautiful Instagram feeds on your WordPress site, then you can do it from any of the above-mentioned plugins. Hope the article is helped you to find the right Instagram Feeds Plugin for your WordPress site. If you have any queries, suggestions, and recommendations regarding the above mentioned WordPress Instagram Feed Plugins then feel free to write on the comment box below. Hey Buddy!, I found this information for you: "5+ Best WordPress Instagram Feed and Gallery Plugins (Premium List)". Here is the website link: https://wpallclub.com/best-wordpress-instagram-feed-plugins/. Thank you.